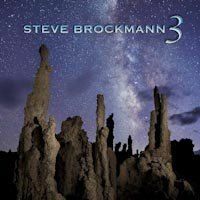 German musician Steve Brockmann came to my attention as one half of the duo that produced the fabulous Airs: A Rock Opera album. In the meantime, Steve has obviously not been idle, but instead been sharpening his claws with some instrumental compositions, presented on his solo album, simply called 3. As much as Airs was a mixture of different textures, moods and even genres, 3 is a similar affair, incorporating many different facets of music, while still maintaining a coherent and unified vision of the album. When you first hear a guitarist is making an instrumental rock album, the first thing that pops into your mind is: “Oh no, not another Surfing with the Alien.” Knowing Steve’s music a little bit beforehand, I had an inkling it would not be as simple as that. And I was right! While you do get the occasional moment of guitar bravado, Steve tends to steer clear of stereotypes and instead focuses on creating a good piece of art. The first few pieces show off Steve’s rock credentials, which he soon spices up with fiery blues and even a hint of jazz. We’re even taken to old style country folk territory with Duncan’s song, embellished by electric guitar at the end. Although classic rock, hard rock and progressive music are dominant, Steve seems quite at home with other genres as well. The first part of the album concludes with Explorers. The final suite is more pensive and moody and creates a lovely contrast to the rest of the album and presents Steve in a slightly different light – as someone who places the utmost importance on atmosphere as well as melody. Yes, it is a rock instrumental album, but no it’s not Surfing with the Alien “no. 1000000”. Steve manages to stamp his identity and voice on this effort, as well as paying homage to the old masters that came before him. A fine artistic effort and a pleasure to listen to.